Recent activities of the Europe-Korea Foundation (EKF) could be exemplary for others to follow in its way of helping needy local folks particularly estranged children. 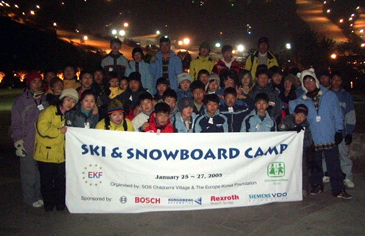 Sponsored by EU companies operating in Seoul, the foundation has been involved in a host of generous social activities: organizing a ski trip for local orphans, holding a Christmas party for needy children, and donating goods to an orphanage. Here are the stories of each event EKF organized recently. 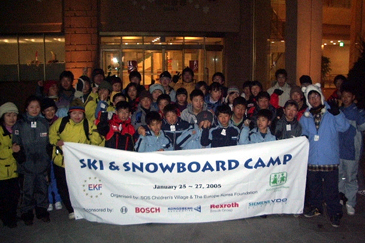 A group of South Korea's needy children were able to enjoy winter skiing thanks to the Europe-Korea Foundation (EKF). EKF Director Nicole Risse said Jan. 28, 2005 that four EU companies — Bosch Rexroth, Kongsberg Automotive, Robert Bosch, and Siemens VDO Automotive — donated money to the foundation to provide the children of SOS Children's Village with a unique winter holiday memory. The donation was made following an appeal in early December of 2004 to raise money for a ski trip for the children. Together with the SOS Children's Village, EKF organized a trip to the slopes for the children during this year's winter vacation season, she said. 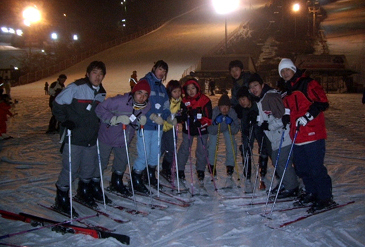 Sixty-five children of the SOS Children's Village spent three days at Daemyong Vivaldi Ski Resort in Gangwon Province from Jan. 25-27, 2005. As a finale for their winter vacation, the children and their caretakers had time to play in the snow and learn how to ski from instructors at the resort. Since 2002, EKF — which is the foundation of the European Union Chamber of Commerce in Korea (EUCCK) — has been working together with the SOS Children's Village, a South Korean orphanage. 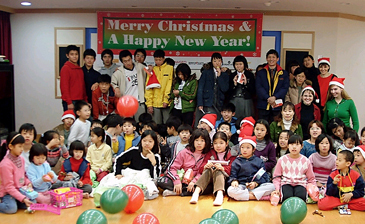 On Dec. 15, 2004, EKF organized a Christmas party for 120 children of the SOS Children's Village and their caretakers with the support of some member companies of the European Union Chamber of Commerce in Korea (EUCCK). The Christmas party started with dinner sponsored by Hippopotamus and was followed by cakes and pastries sponsored by Jubilee and Shany Bakery. After dinner, every child received a Christmas present, which was made possible by Arkema, Balance, Clariant, Cray Valley, Diageo Korea, and the Koreana Hotel. Some EUCCK member employees also helped EKF's effort through private donations of toys. The gifts were donated at the EUCCK Christmas Network Club Evening in early December 2004. During the Christmas party the children were able to learn about Christmas and how it is celebrated in Europe. After receiving their presents, the finale of the evening was a showing of "Shrek 2," made possible through the money raised through the EKF Movie Coffee Mornings at Seoul Club. Some children were so excited with their new toys that they had trouble paying attention to the movie. For many of the children, this was the first Christmas celebration ever, and some are already eagerly awaiting next Christmas. 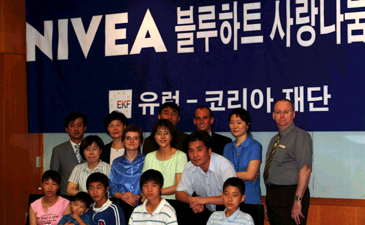 Nivea, in cooperation with the Europe-Korea Foundation (EKF), has generously donated hygiene products and make-up to the children and mothers of the SOS Children's Villages, as well as to the young women of Aeranwon, in an effort to support South Korean charity organizations and to contribute to South Korean welfare. The three South Korean branches of the SOS Children's Villages are located in Daegu in South Gyongsang Province, in Suncheon in South Jeolla Province as well as in Seoul. Each orphanage consists of about 10 to 15 families, each of which can accommodate up to eight children. Aeranwon is a South Korean charity organization that cares for the physical and mental wellbeing of struggling, underage, single mothers by providing facilities and support hot lines. The products donated by Nivea improve the daily life of the children and young women helped by the two organizations. In the end of August of 2004, LEGO Korea donated LEGO sets to the children of the SOS Children's Village. All the children from the villages in Daegu, Seoul, and Sucheon were provided with their brand new LEGO toys. Social commitment is deeply rooted at the LEGO Company. LEGO was the first toy manufacturer to join the Kofi Annan Initiative Global Compact in 2003. Adopting the principles of the Global Compact Initiative, LEGO reflects a desire to behave decently and to assume a share of the responsibility for helping to solve the major issues facing the world in areas such as human rights, labor standards, and environment. In this respect the company wishes to make a contributions within its special field of competence, i.e. the child's right to play and to learn through play. The donation was spearheaded by EKF, which supports South Korean charity organizations and is committed to deepening relationships between the EU and the Korean Peninsula through its various programs, one of which is the distribution of scholarships to Korean students wishing to study in the European Union. Ms. Oxana Davydenko serves as staff reporter for The Seoul Times. She covers foreign embassies in Seoul with a particular focus on Russia, and Eastern European embassies. Davydenko also covers international cultural events including business. Previously she worked as a journalist for Kommersant business daily in Russia. She majored in journalism at the Voronezh State University.